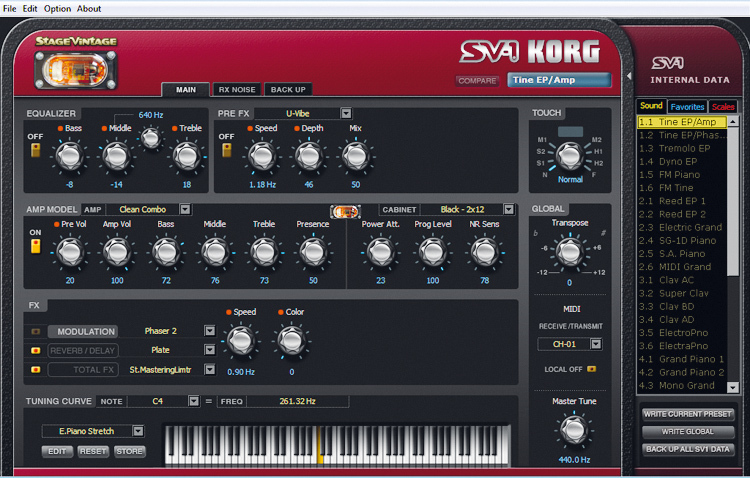 The SV-1 delivers some of the best electric/acoustic piano sounds with great effects and amp sims too. Some of the best Rhodes, Wurli and acoustic/electric piano sounds available. Very playable action and a doddle to use. Great FX and amp modelling with stretch tuning and velocity curves. Hammond sounds are weak. Synth/string sounds feel like an afterthought. A semi-weighted waterfall keyboard version would be nice. The SV-1 is Korg's first foray into vintage keyboard territory. Though samples of Rhodes pianos, Wurlitzer EP200s, Hammond B3s and Hohner Clavinets can be found in Korg's workstation keyboards, the SV-1 packages these sounds (newly sampled and optimised for the SV-1) in a completely new way. Available in two sizes (73 and 88-note) both models utilise Korg's RH3 graded-hammer action keybed (found in the M50 and M3-88). It feels positive, expressive and nicely balanced (though a little too spongy on the bounce-back for our liking) and it's very controllable for pianos and Rhodes/Wurlis. Plus, the onboard velocity curves broaden the scope. When it comes to playing Clavs and organs, the RH3 action isn't quite fast/ responsive enough, though experimenting with the velocity response improves the playability. 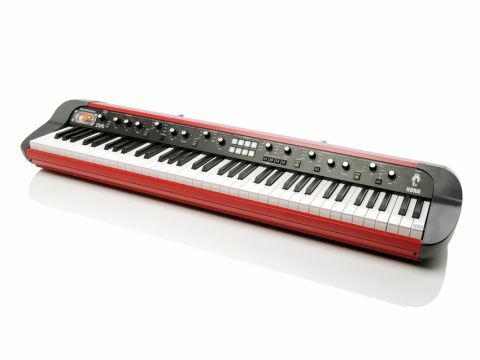 It would be nice, though, if Korg offered a semi-weighted waterfall keyboard option (like the Nord Electro 3/Stage Compact) as we dare say many players would rather play pianos, Rhodes and Wurlis via a semi-weighted keyboard than Clavs, Hammonds and strings on a weighted board. Also, bear in mind that the SV-1 73 is pretty heavy to transport (and weighs even more in a flight case) while the 88 is a definitely two-man carry job. We commend Korg for making a fantastic looking keyboard that will certainly turn heads, though it's a real shame you can't stack other keyboards on top of it. The front panel is very simple to use and selecting from the 36 onboard sounds is a doddle using the rotary selectors. The effects, EQ and amp model selections (and pretty much everything else) are child's play with no menu diving at all, though the software editor can go deeper into tailoring the amp modelling, effects, tuning scales and more. There are six banks (Electric Piano 1 and 2, Clav, Piano, Organ and Other) with six variations available within each category. Plus, you can store your favourite eight sounds to the large favourite buttons for quick recall. "The front panel is very simple to use and selecting from the 36 onboard sounds is a doddle using the rotary selectors." Now onto the sounds and, specifically, the Rhodes (Electric Piano 1). We have to say that the SV-1 has probably the most authentic emulation of a real Rhodes that you could find in a current keyboard. We wouldn't hesitate to use it for both comping and solo work and it's very playable indeed. The RX (real experience) technology onboard really captures the nuances of a real Rhodes (including mechanical and electric noise) and this adds greatly to its authenticity. All the Rhodes samples are very dynamic (from soft/bell-like to hard/ barking) and in general the transitions between soft/hard samples are smooth enough. I also love that there's the option to choose preset or user stretch-tuning curves. The Wurlitzer EP samples are also very authentic, (though it's worth experimenting with the different velocity curves/EQ to get the best from them) though the Clavs aren't quite as authentic as we'd like. They sound a little thin/nasally and there's no muted Clav option either. However, they are musical and in the context of a band performance cut through nicely. Overall, we're pleased to say that the acoustic and electric pianos onboard are excellent and very inspiring to play. The RX technology has captured the important nuances of a real piano in particular, including pedal noise, key on/off noise, damper noise and (like the Rhodes) this adds greatly to a very satisfying playing experience. The SV-1 has some of the best acoustic piano samples we've heard or played. There's also a great Yamaha CP80-style electro/acoustic piano onboard and some nice piano/string combos, though these sounds are preset and can't be edited (and there are no splits or layers available either). Bearing this in mind, Korg needs to offer a large and varied library of user-downloadable samples to expand the SV-1's palette ASAP. "The SV-1 has some of the best acoustic piano samples we've heard or played." The weakest part of the SV-1 is its organ/synth sounds. The reed organs are nice but the Hammond emulations just don't sound authentic and the only way to change the vibrato/chorus is via the editing software, which isn't ideal. Also bearing in mind there are no drawbars or filters, we think Korg needs to make some better Hammond/synth samples available for the SV-1 pronto as they just aren't good enough at this price point. The SV-1 is no slouch in the effects department. There's a very musical three-band EQ for subtle or drastic tonal shaping plus some very authentic stompbox or 'pre' effects including a compressor, booster, univibe, vibrato, tremolo and a lovely emulation of a Vox wah that can be controlled via an external pedal. Then there's the real valve stage utilising the very visible 12AX7 valve, which brings a natural overdrive to the amp models. Modulation effects include some nice choruses and phasers that help create some very nostalgic instrument/effect combos, plus there's a decent rotary speaker effect that can be applied to any of the instruments. The onboard reverbs and delays are great too and really have the vintage vibe where required, or can remain fairly transparent. Finally, there's a limiter to keep levels in check. To conclude, as a Rhodes/Piano emulator the SV-1 hits the spot in terms of authenticity and playabilty and the Clavs are good too. However, the Hammonds are disappointing, while the onboard synth/string sounds seem like a rushed afterthought. Bearing in mind the SV-1's high price point Korg massively need to improve on these areas ASAP. These gripes aside, we would not hesitate to recommend the SV-1 immediately if you're after very authentic and playable Rhodes, Wurlitzer and Piano sounds.